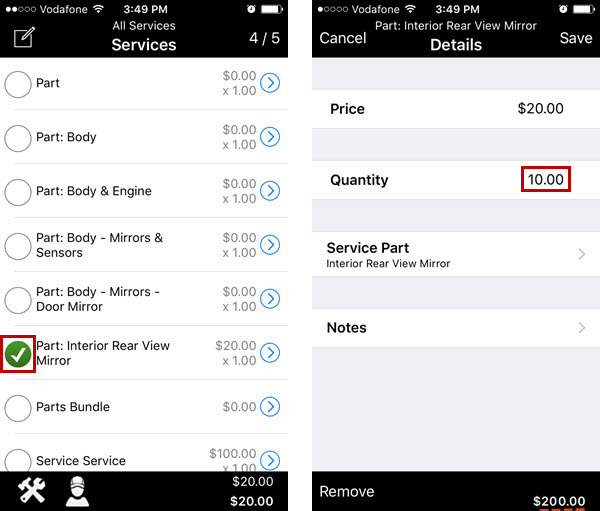 Parts services are services with the Parts price type that allows selecting a particular part from a built-in parts catalog. Note ReconPro uses the Aftermarket Catalog Exchange Standard (ACES) parts catalog, in which parts are grouped into categories and subcategories. 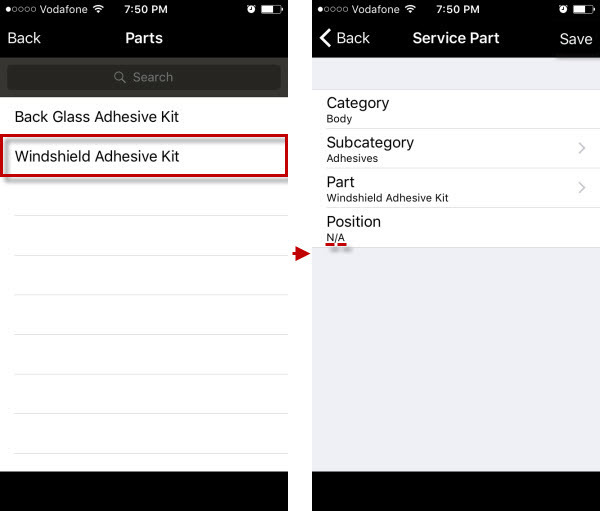 The parts catalog is automatically downloaded or updated on device after downloading or updating the main database. On the Company tab, click Services, and then on the Services page, click Add on the toolbar. 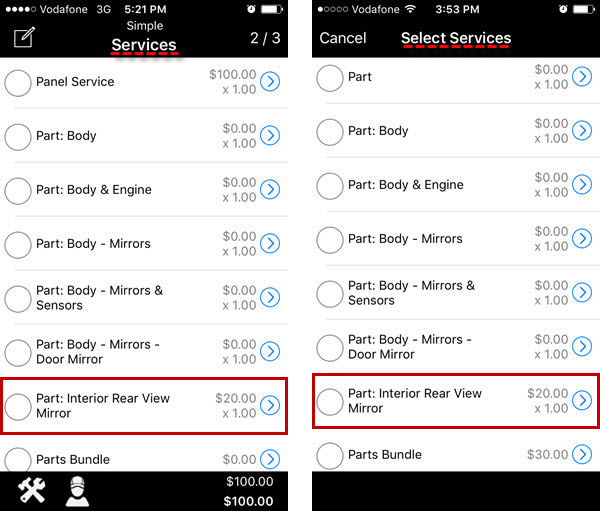 In the Service dialog box, enter the appropriate part name in the Service Name box, and click Parts in the in the Price Type box. 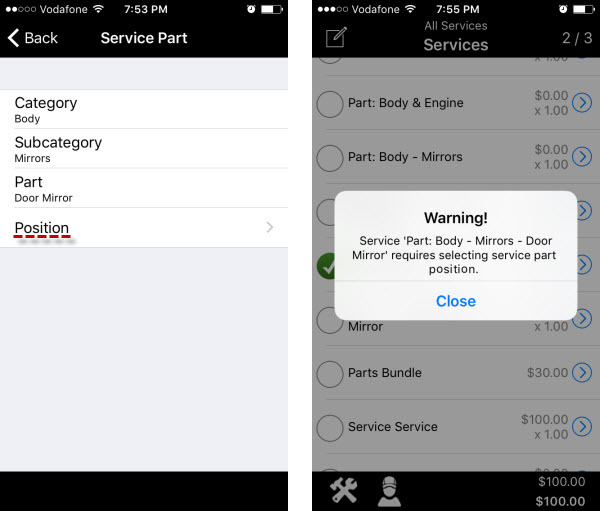 Tip Do not enter technician-related settings because parts services cannot be assigned to technicians. 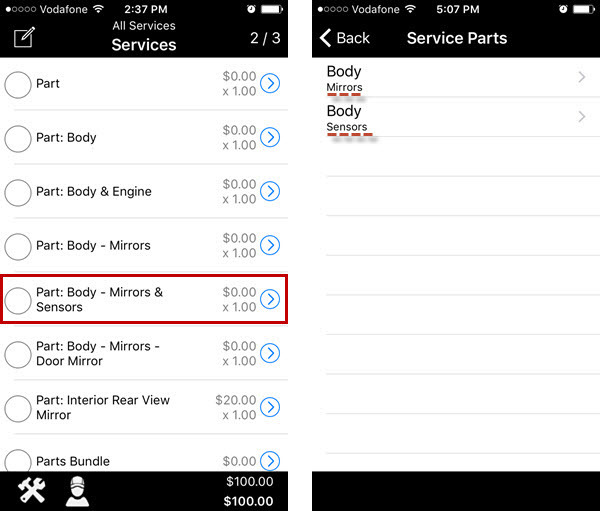 Uncategorized parts services are services which category, subcategory, and part name are not specified. 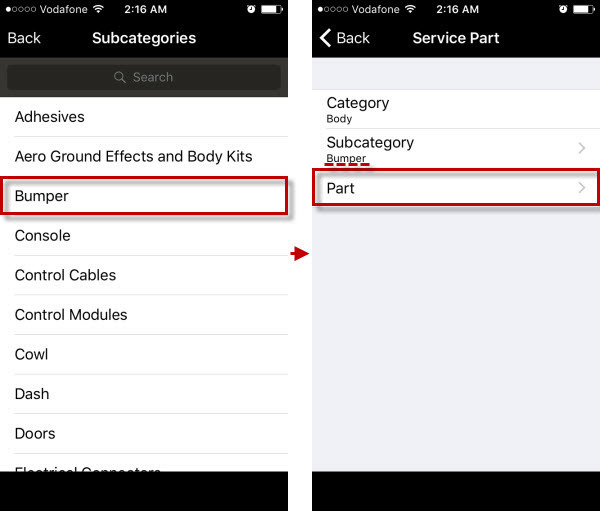 Leave the Category box, the Subcategory box, and the Parts Name box empty. 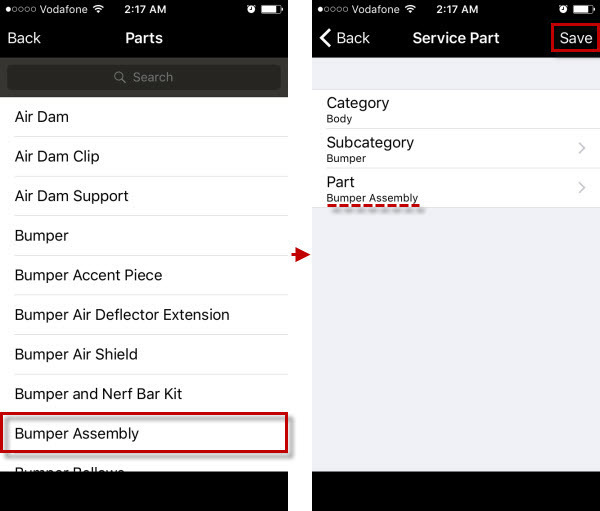 Partially-categorized parts services are services which category is specified, or both category and subcategory are specified, but which part name is not specified. Click the appropriate category in the Category box, if needed, click the appropriate subcategory in the Subcategory box, and then click Add. 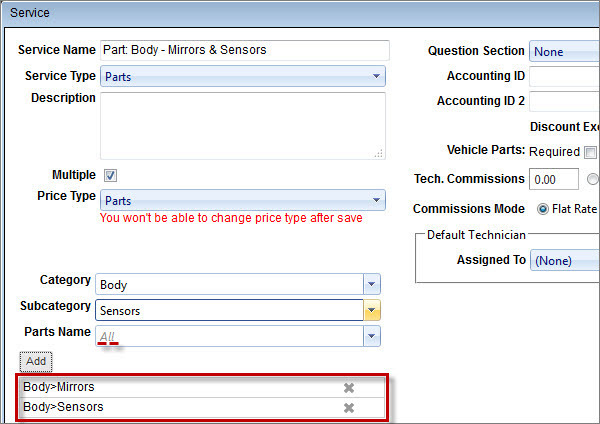 Tip You can add multiple partially-categorized parts to one parts service so that technician can select a part from one of the specified categories or subcategories. 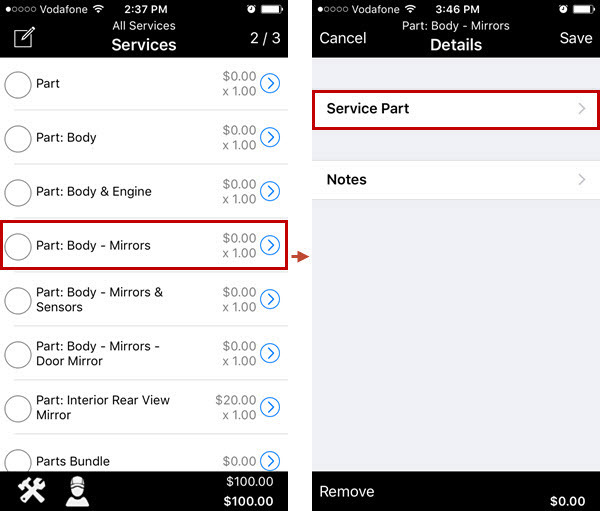 Categorized parts services are services which category, subcategory, and part name are specified. Click the appropriate category in the Category box, click the appropriate subcategory in the Subcategory box, click the appropriate part in the Part Name box, and then click Add. 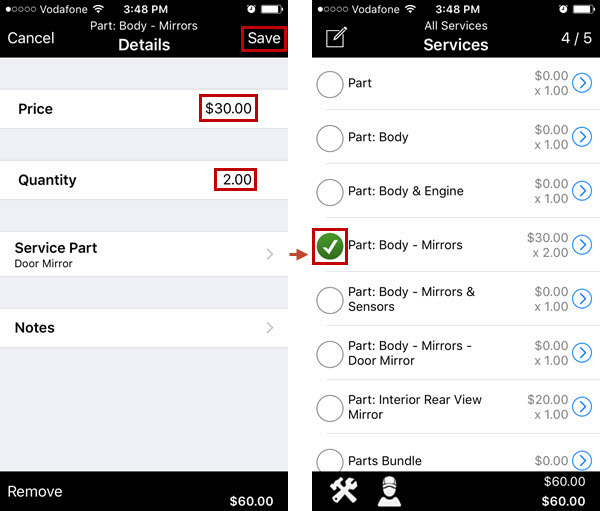 Note You can add only one categorized part to a parts service. When a categorized part has been added, you can specify the Wholesale Price and the Retail Price of the parts service. 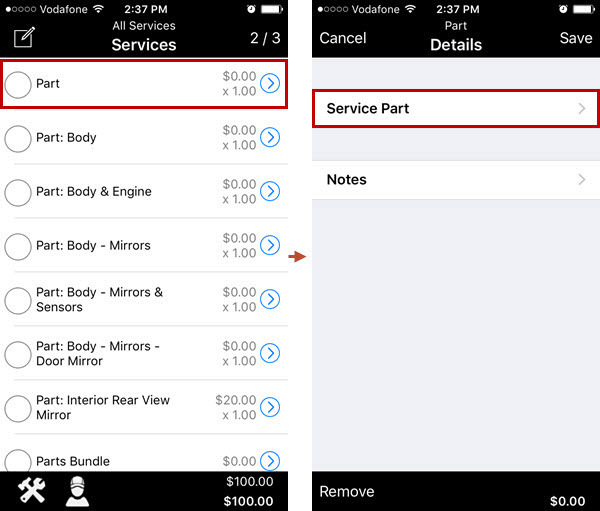 By default, parts services are automatically assigned to the All Services package. You can assign them to any other service package, as well as add them to a bundle package, and assign them as additional services to a price matrix. On the Company tab, click Service Packages, and then on the Service Packages page, click the Services link next to the appropriate service package of the Order form type. 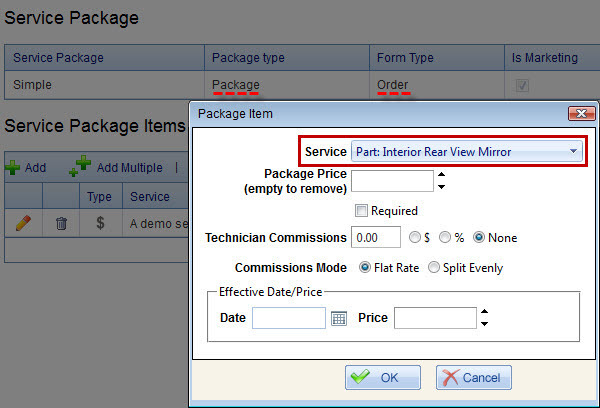 On the Service Package Items page, click Add on the toolbar, and then in the Package Item dialog box, in the Service box, click the appropriate parts service, and click OK. 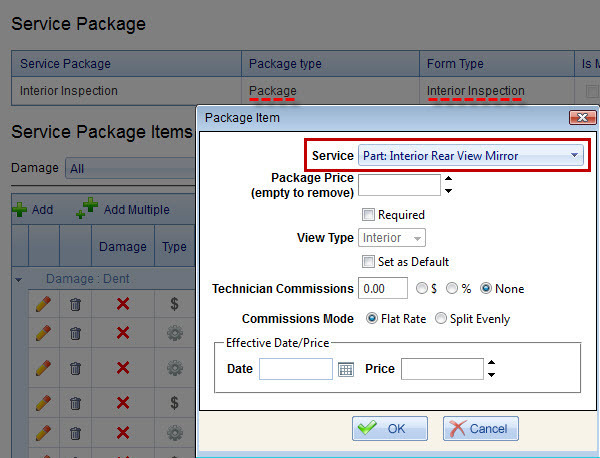 Note If a parts service is assigned to a service package of the Order form type, this parts service is shown on the Services screen and on the Select Services screen of an inspection or a work order to which type this service package is assigned. On the Company tab, click Service Packages, and then on the Service Packages page, click the Services link next to the appropriate service package of the Exterior form type or the Interior form type. 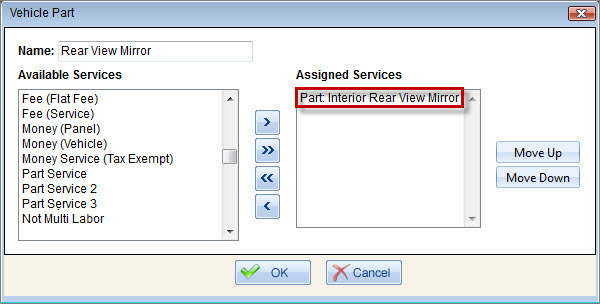 Note If a parts service is assigned to a service package of the Exterior form type or the Interior form type, this Part Service is shown on the Visual screen of an inspection to which type this service package is assigned. On the Company tab, click Service Packages, and then on the Service Packages page, click the Services link next to the appropriate bundle package. Note If a parts service is assigned to a bundle package, this parts service is shown on the Bundle screen of the bundle service to which this bundle package is assigned. 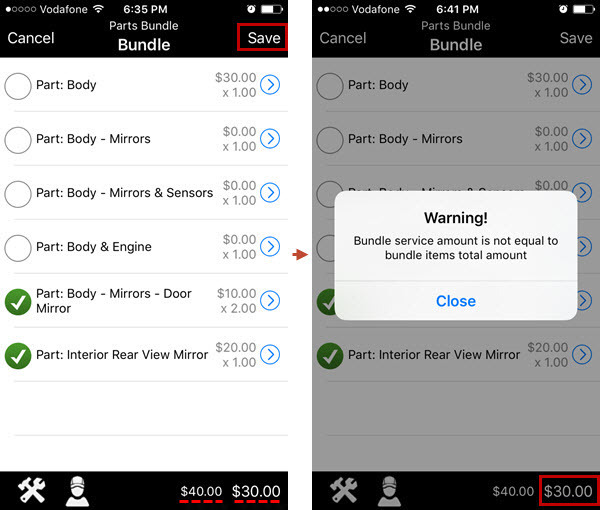 … to type the bundle service amount that matches the total amount of selected bundle items. 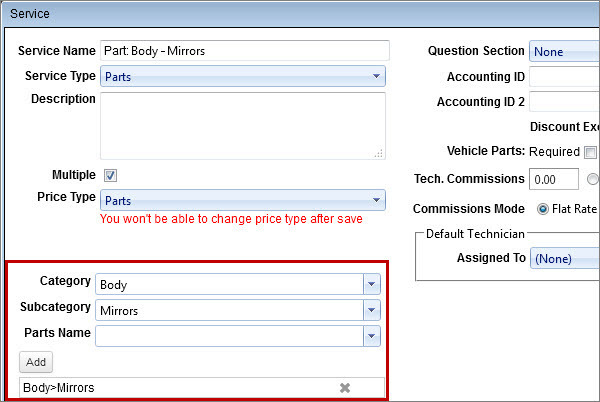 On the Company tab, click Vehicle Parts, and then on the Vehicle Parts page, click Edit next to the appropriate vehicle part. 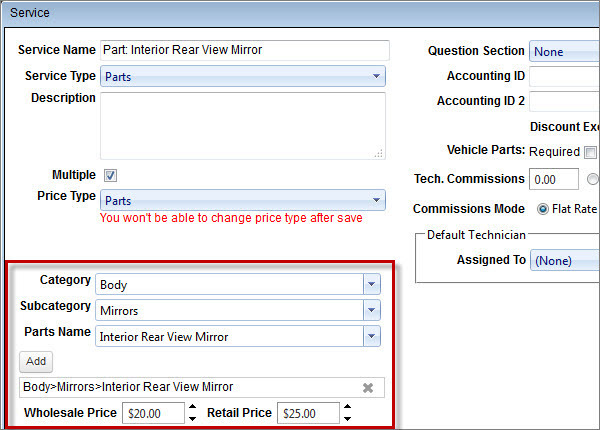 In the Vehicle Part dialog box, click the appropriate parts service in the Available Services box, click the right-pointing arrow to move selected parts service to the Assigned Services box, and then click OK.
On the Company tab, click Price Matrices, and then on the Price Matrices page, click the Prices link next to the appropriate price matrix. 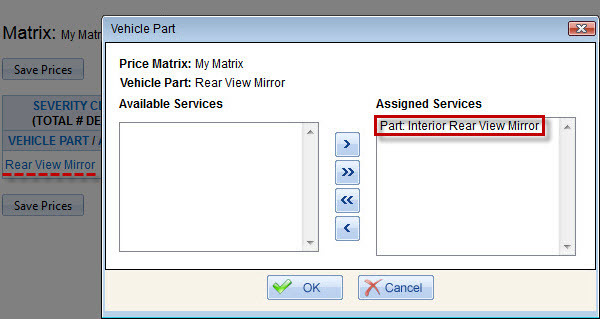 On the Matrix page, click the appropriate vehicle part, and then in the Vehicle Part dialog box, click the appropriate parts service in the Available Services box, click the right-pointing arrow to move selected parts service to the Assigned Services box, and then click OK. 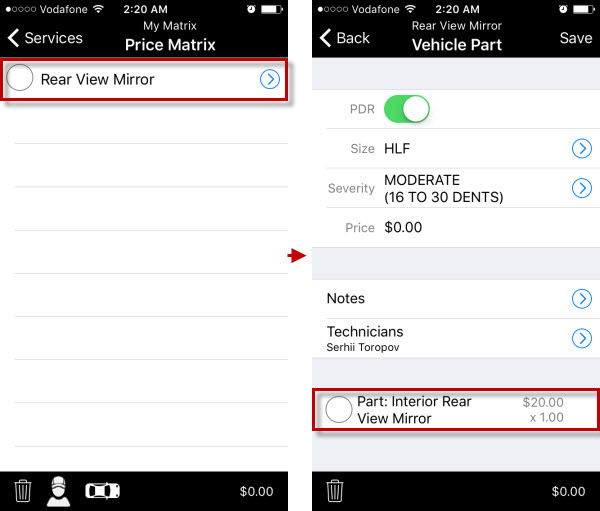 Note If a parts service is assigned to a vehicle part in a price matrix, this parts service is shown on the Vehicle Part screen of the price matrix service to which this price matrix is assigned. Technicians can add parts services to inspections and work orders to specify the parts which should be ordered to replace old or broken parts in serviced vehicles. 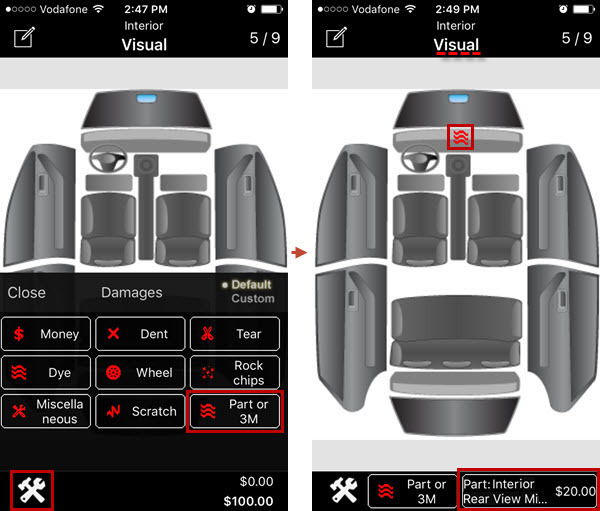 Tap the parts service that you want to add, and then on the Details screen, tap Service Part. 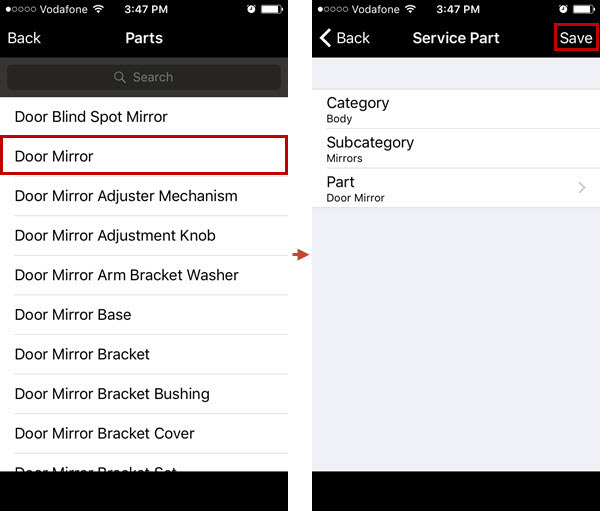 On the Service Parts screen, tap <Category> <Subcategory>, and then on the Service Part screen, tap Category. 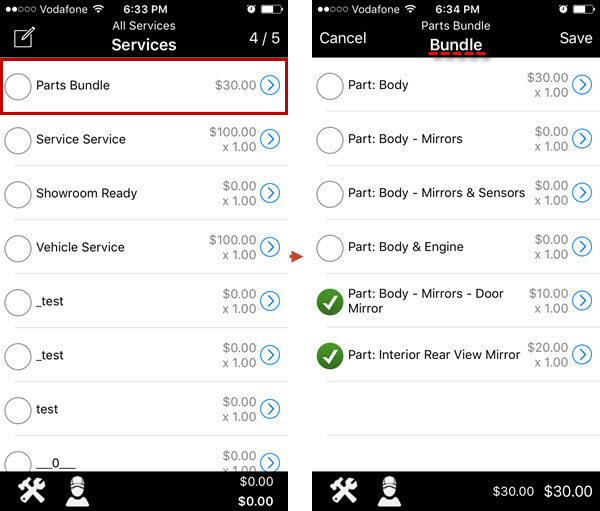 On the Categories screen, tap the appropriate category, and then on the Service Part screen, tap Subcategory. 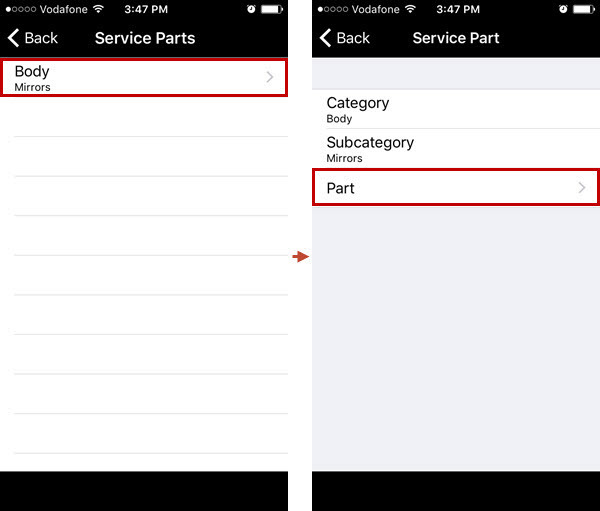 On the Subcategories screen, tap the appropriate Subcategory, and then on the Service Part screen, tap Part. 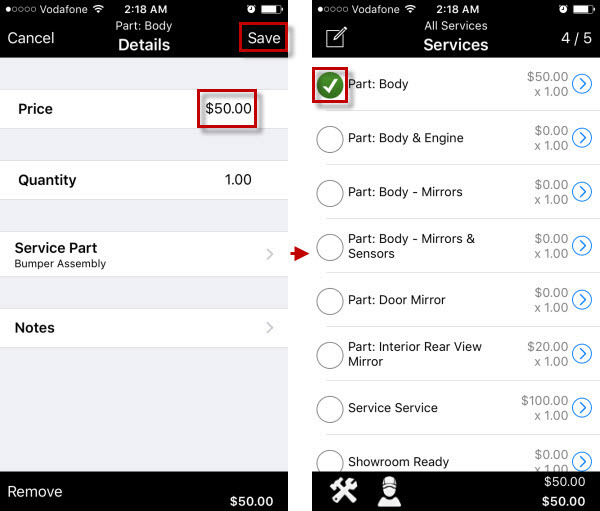 On the Parts screen, tap the appropriate part, and then on the Service Part screen, tap Save. ...otherwise the parts service cannot be saved. 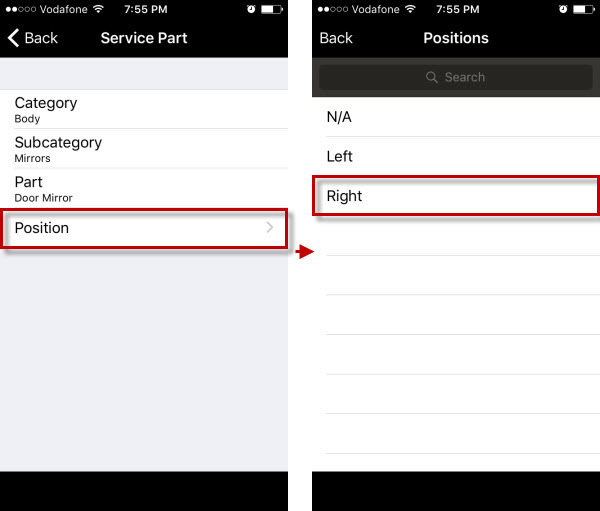 Note If a part has no available position in the Parts catalog, then the N/A position is automatically added to the Position field when such part is selected for Part Services. On the Details screen, enter the price, if needed, change the quantity, and then tap Save. 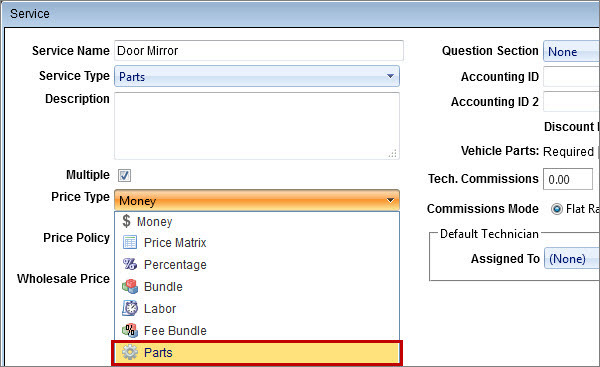 If a parts service is partially categorized in the Back Office application, you need to select the appropriate part in the parts catalog without selecting its category or subcategory. 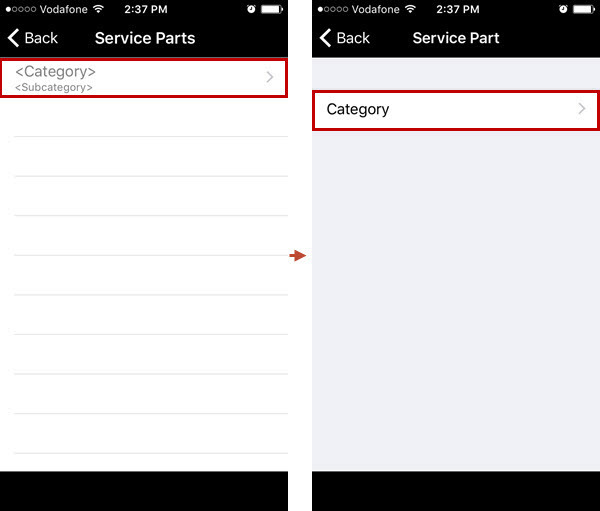 On the Service Parts screen, tap the category with subcategory, and then on the Service Part screen, tap Part. 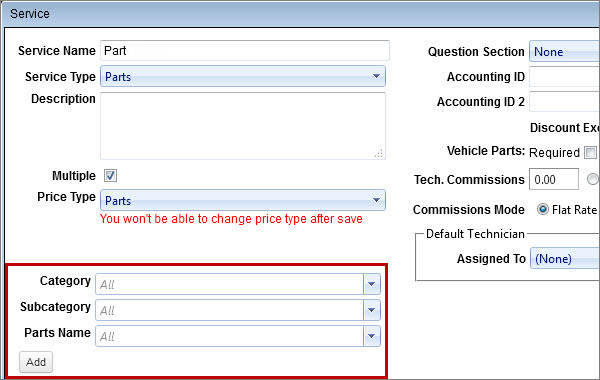 Note You don’t need to select a category and a subcategory because they have been specified for this parts service in the Back Office application. 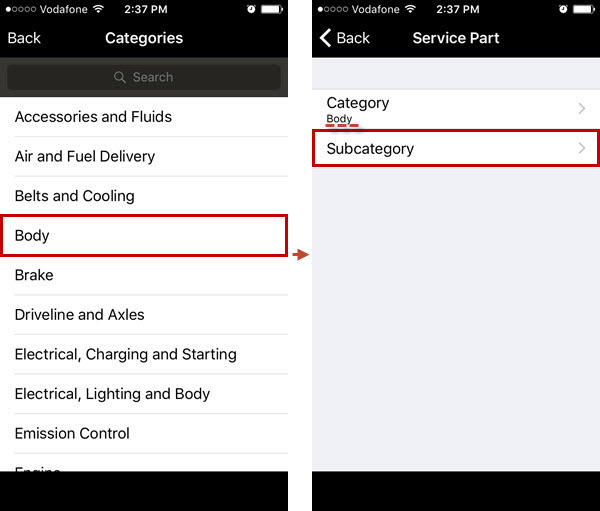 Note If multiple categories and subcategories have been specified for this parts service in the Back Office application, then you can choose the appropriate category or subcategory, and then select the appropriate part. If a parts service is categorized in the Back Office application, you can add it as-is to an inspection or a work order. Tap the circle on the left side of the service. 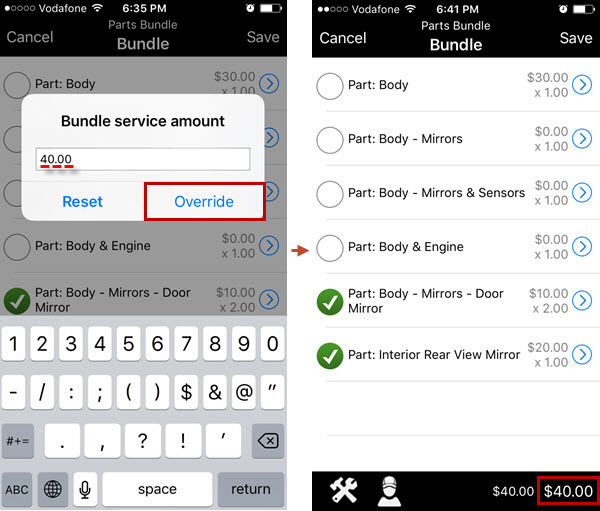 Tip If you want to change the price or the quantity of the parts service, tap the circle with the right-pointing arrow on the right side of the service, and then on the Details screen, make appropriate changes, and tap Save.